"My friend passed his test first time and recommended Nigel to me. I really enjoyed learning to drive with Nigel and passed first time too! In my opinion, you won't find a better instructor or better value for money." 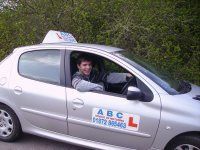 "I am very much enjoying my driving lessons with Nigel. I feel very safe and comfortable alongside Nigel whilst learning to drive, and look forward to my lessons. I am confident that all Nigel's help will give me the best chance of passing my upcoming test." "I really enjoyed my driving lessons with Nigel. He prepared me extremely well for my driving test and I passed first time! Due to Nigel's enthusiasm and optimism, I felt really confident in my driving lessons. I would strongly recommend him to anybody who is looking for a driving instructor." "I learnt to drive with Nigel from start to finish. I found him consistant and thorough with his teaching techniques, whilst being calm and understanding at the same time. This helped me a lot as I was/am a very nervous driver and he helped me feel as comfortable as I could in front of the wheel. I highly recommend him as an instructor and I am glad I didn't go elsewhere; he's a great character and a pleasure to know."